Next up in the 2018 PopCult Gift Guide is our most generic suggestion of the year, a Tiki mug. We are not recommending a specific Tiki mug, but will point you to a really great online source for Tiki mugs and other stuff at prices ranging from dirt low to still quite reasonable. Swiping liberally from the Wikipedia, let me explain that Tiki mugs are large ceramic cocktail mugs that originated in tiki bars and tropical-themed restaurants. The term “tiki mugs” is a generic blanket term for sculptural drinkware that depict Polynesian, mock-Polynesian, or tropical themes. Even a non-drinker like your PopCulteer can enjoy the craft and artistry that goes into creating this cool mugs. These are the perfect gift for the person with an appreciation of all things Tiki. Also, according to Wikipedia, Tiki mugs are not commonly seen outside tiki bars and restaurants, but are also a kitsch collectors item. It is that collectors item part that makes this a great gift idea. Your PopCulteer has recently made room to start a collection of Tiki mugs, and it’s a great way to enjoy the trappings of mid-century Tiki culture in your own home. Originally created as both signature and marketing tools to hold the exotic libations, the 1960s also saw the ceramic craft market following suit by releasing ceramic tiki mug molds for the hobbyist to customize. These original mugs, whether related to a location or made by the hobbyist, also known as the vintage mugs, once found in abundance on the dusty shelves of junk shops in the 1980s and 90s, became a sought after item for those who were responsible for the revival of interest in the heyday of places like Don the Beachcomber and Trader Vic’s. Though hobbyists and ceramic artists, in a small capacity, have continued to make these mugs at home, and larger manufacturers have mass-produced restaurant and bar promotional souvenirs since the 1960s the “tiki revival” of the 1990s and then 2008 onwards produced new variations. 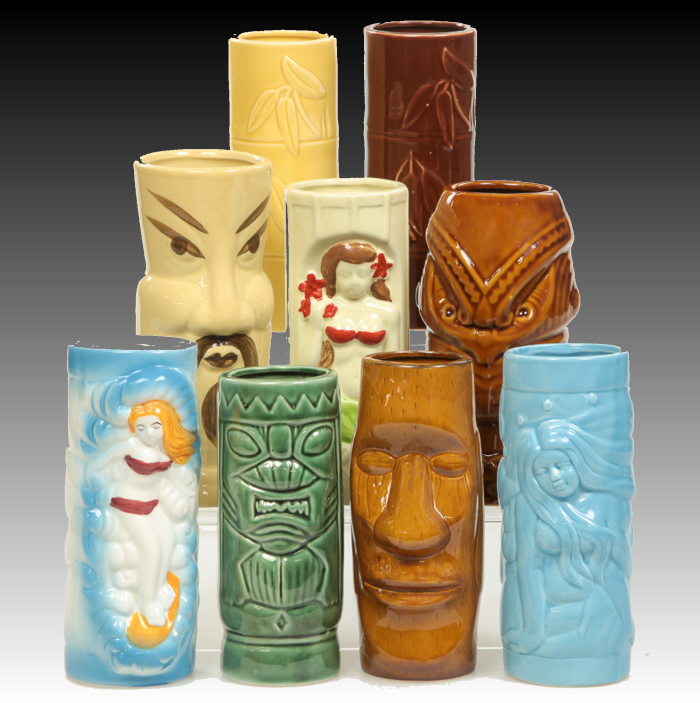 At the website, Retro Planet, you will find a wide range of recent, yet very cool Tiki mugs. They offer “instant collections,” where you can get four, five or more mugs for one low price, and they have individual Tiki mugs that range from under seven dollars to upwards of fifty bucks. Many fairly elaborate mugs are under thirty dollars each. They offer over two hundred mugs, along with other cool Tiki items and tons of other cool pop culture, Americana and automotive collectibles at their website.